Where is your Clinical Information? Storage, access and traceability of data are vital to reducing regulatory submission time for pharmaceutical, biotechnology and medical device companies. 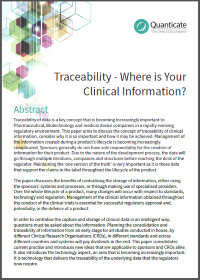 This paper outlines why sponsors of clinical trials should re-examine and plan for proper traceability of their clinical information. The benefits of centralising the storage of information, either using the sponsors’ systems and processes, or through making use of specialised providers. Planning the consolidation and traceability of information from an early stage for all studies conducted in house, by different CROs, in different standards and across different countries and systems.